Seriously, I can’t handle the fact that gas is going up. It’s driving me crazy. If I did not have two kids, I’d be riding my bike everywhere. We are up to $4.30 here. Yikes! And I keep hearing that it’s going to double. Double!! I mean, this is ridiculous and something has to be done. Yesterday, I had to fill up. 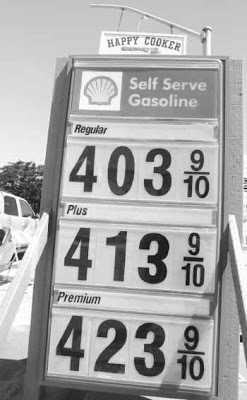 And every gas station I stopped at, I was like–there is no way I’m going to be paying that price. So I would drive to the next station. Well, I was not the only person doing this. There were two other cars behind me doing the same thing. We finally found a station that at $4.16. It seemed to satisfy me but not the other two cars. They drove off. I wonder if they found a cheaper station. The post This Is Ridiculous! appeared first on Darling Darleen | A Lifestyle Design Blog .